Dolphins are such successful hunters that they usually have a lot of time to just play around. Both in captivity and in the wild, dolphins have shown that they can catch on to a game quickly. They also tend to invent new games on their own. It has been observed that these games even have develop rules, and that individuals caught breaking the rules may be scolded. During birth: When a female dolphin (cow) is giving birth, two or three other females usually assist in the process. 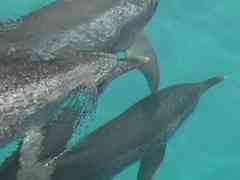 Protection of young: Dolphins often swim in formations keeping the calves in the center of the pod for safety. Mother and calf relations: Most calves remain with their mothers for at least two or three years, often even longer. It seems that there is much vocal communication between the mother and calf as well as physical communication. When the word dolphin is mentioned, one of the first things people think of is "Flipper ". This portrayal of dolphins is inaccurate because it gives dolphins too many human characteristics. In captivity, dolphins can be trained to understand and interpret some words and actions, but they cannot understand us word for word like in the TV show. National Parks in Costa Rica which protect marine areas with dolphins and whales are Ballena National Marine Park, Gandoca Manzanillo Wildlife Refuge, and Santa Rosa National Park.